The Roberts were not trying to predict the future General election but instead influence the Dem Primary to ensure a self described socialist doesn't represent the party. As far as Dems ignoring Trump; nothing could be further from reality. E.g. the Dems that have declared they are running for the nomination are mostly attacking Trump and saying why they would be a better President than Trump, instead of saying why they are better than the other Dems. Note that the Emanual article stresses the same line; don't attack each other, don't try to settle major policies differences during the primary campaign. Of course this is just wishful BS thinking from the DNC. The posts re: the Dems ignoring Trump was for the 2016 election - not the one coming up. Regardless, the Roberts are correct at this point and it is never to early to build a winning foundation for an election. A point upon which you agree. I doubt a self-described socialist will be the Dem party candidate for president in 2020. They seemed to focus a lot on AOC, but there's not much the Dems can do about her. effect in the general election. I agree that Bernie isn't likely to win the Dem nomination, but many other Dems, E.g. Harris, have taken up his platform, clearly many Dems running have moved to the left. If to win states like CA (which I believe will be THE major factor in the primary since CA moved its primary from June to March), Dems have to move even more to the left on all issues (e.g. immigration, abortion even after viability etc...), and a Dem that stated those views during the debates is the winner, that Dem will likely lose those same battleground states that Clinton lost. It really is very basic; what it takes to win the Dem primaries in CA, NY, and other blue-blue states is what will cause voters in those battleground states to vote GOP. So the Dem candidate will again receive more popular votes but lose the election. loser in a general election, even against a dope like Donny. Unfortunately, the RNC and Republicans in general will be making copies of every commercial and statement made by the Dem candidates. They will then use them against the ultimate winner. Unfortunately, the Dem candidates will feel compelled to adopt the Leftist/Progressive/Socialist agenda - or at least parts of it to win the nomination. Just as Republicans adopt the Rightest Extremist positions to win their party nominations. It will have an effect for the Dem candidate in the battleground states in Nov.
investigations will dig up on Trump between now and the election. I hope that your optimism is correct, but I doubt it. People knew what Trump was in 2016 and it did not matter. As for the investigations, the longer it goes on the less I believe they will find anything that will substantially affect Trump and his administration. Just as they found nothing that really hurt Bill Clinton - and he lied under oath. 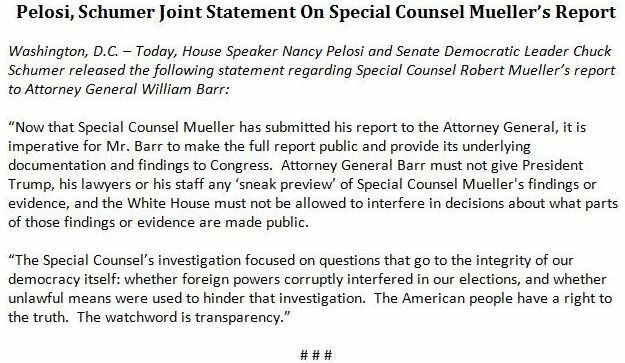 "It is imperative for Mr. Barr to make the full report public and provide its underlying documentation and findings to Congress ... The American people have a right to the truth." Some people assumed he might grow into the office instead of continuing to be a jackass. long history of shady business practices, things that were ignored for the most part for years. the election. I'll have to wait and see how things develop. At a forum in Washington, candidates said it wasn't enough to come up with new policy ideas, but that the system has to be changed to implement them. "...........the We the People summit — a forum focused on so-called democracy issues — offered eight candidates a chance to speak one-at-a-time to progressive activists representing labor unions, the Sierra Club, Planned Parenthood and other groups. Democratic presidential candidates Cory Booker, Julian Castro, Amy Klobuchar, Beto O'Rourke, Bernie Sanders, Elizabeth Warren, Jay Inslee, and Kirsten Gillibrand spoke Monday at the annual "We The People" summit in Washington D.C.
None of it will happen. Just a waste of time, money and energy that could be better directed. As for the filibuster, if it had been eliminated, Trump and Company would have passed every single bill they wanted to and approved every single judge they wanted to. Be careful what you ask for. Harry Reid learned this the hard way. Now if only democracy was abolished..
President Obama warns Democrats not to destroy each other during the primary process. Vigorous debate is fine with me. that weaken the Democratic nominee in next year’s general election. “One of the things I do worry about sometimes among progressives in the United States, maybe it's true here as well, is a certain kind of rigidity where we say, ‘Uh, I’m sorry, this is how it’s going to be,’ and then we start sometimes creating what’s called a ‘circular firing squad,’ where you start shooting at your allies because one of them is straying from purity on the issues,” Obama said at a town hall in Berlin, Germany. ".......Of course, Obama retorts, “You have to recognize that the way we’ve structured democracy requires you to take into account people who don’t agree with you, and that by definition means you’re not going to get 100% of what you want.” But the real problem the Democrats faced in 2016 wasn’t that they were too strident in putting forward a purist progressive vision. Rather, Clinton ran a campaign mostly about shielding Americans from the nightmare of Trumpism and not presenting dreams for the future. When people say they have been falling behind for the last 30 years and your retort is: “I can fix that, I’m experienced, I’ve been in politics for 30 years,” you might end up losing an election. "...Obama’s remarks reflect a growing sentiment among many establishment-minded Democrats, who see many in the party’s activist wing as overly concerned with ideological purity at a time when they had hoped the party would unite around a common goal of ousting President Trump. That push for ideological rigidity, they say, threatens to yield a fractious and bitter primary contest — and, ultimately, a second term for Trump. While the party’s presidential primary contest has so far remained civil, skirmishes are already erupting among some Democrats in the House, where progressive members have publicly bucked party leadership and called for primary challenges to Democratic incumbents deemed insufficiently liberal. The Democratic Party has moved to the left on a handful of high-profile issues in recent years, and the field of primary contenders largely reflects that shift. Obama gets it. AOC clearly doesn't. Obama just wants what will get the people to vote in the next election. AOC, Sanders, Warren and the like are really unappealing to most voters. The Democratic Party is creating the same scenario that led to the Republicans forcing out moderates and the party becoming the Tea Party, extremist, party of Trump that we have now. The Dems will go the other way. However, the big difference is that the Republicans can use their catch phrases and apparent policies to charm the independent voters and achieve a 2016 result. On the other hand, the Dems keep offending more and more people and giving them fewer and fewer reasons to vote Dem in 2020. Sanders is going to finally release his taxes - after he edits and sanitizes and redacts them. His still refuses to show how much his Medicare For All plan will cost and how it will be paid for. Good points; Yea, a few days back I wasn't as pessimistic about Sanders' changes of winning the Dem primary as you were, but now I'm there; Sanders has really made some bonehead moves that will be hard to recover from. Related to the Dem Presidential contest; I wonder how much singular (or very narrow), historical 'goofs' will impact candidates. E.g. CNN is providing a lot of coverage to the CA widow of a slain police officer that Harris refused to seek the death penalty for. The coverage is designed to frame Harris has uncaring and much more interested in political grandstanding then 'serving her constituents. E.g. she didn't talk to his women prior to holding a press conferencing announcing her decision. Of course every candidate has some singular historical 'goofs'; I have no idea how much of an impact these will have on Dem primary voters once the gloves come off and each candidate tries to claim 'mine were not as bad as yours!'. PS: As for 'goofs', I'm mostly referring to human interest type stories and the FEELINGS related to them that are not directly related to policy stances (e.g. will those that agree with Harris that there shouldn't be a death penalty still dismiss her based on how she handled this case, and how this wife FELT? ).